When thinking about conversion we usually jump to the seemingly obvious conclusion of increasing traffic. This is the wrong move; generating high quality converting traffic can take time. Increasing a conversion rate on the other hand can happen overnight. This is the very reason that conversion rate optimisation (CRO) is so appealing. The issues come with knowing when to switch on CRO and what exactly you should do. The following graph shows an average site’s traffic growth; a usual speedy incline from a newly launched website, followed by a plateau - this is the time to start with CRO. The reason to not begin before the plateau is because the data would be dramatically skewed due to the growth spurt. Making a change during this time may give the impression of yielding great results, but in reality it is hard to quantify all the other factors, such as brand awareness, rankings etc. Now that we have established when to begin the CRO process, it’s time to look at some ways in which we can increase our conversion rate and squeeze every last sale out of the traffic we already have. What feedback are they getting time after time? Are there opportunities to address concerns on your website? Are there any trust issues? Do you have bricks and mortar? Yes? Then start shouting about it on your site. Have you been mentioned or reviewed by some well known publications? I’m sure I don’t need to say it again, but get it clear as a bell on your website; link to it and have huge arrows pointing at it if you have to. Whatever it takes to make it known to your users that you are recognised by established movers in the industry. After we have drained internal resources of their information, it’s time to start going direct to the customer. One method is to apply a simple online survey to your site. This should be unobtrusive; remember we’re not trying to worsen the user experience - we are trying to make it better. If you make it a required field halfway through your shopping cart, you might as well add a goodbye message while you’re at it. One such questionnaire that you can use however, has been developed by a company called Qualaroo – it’s even free if you don’t mind a little branding. This form will sit quietly in the bottom of your site and wait for people to answer questions and provide you priceless feedback. #winning Don’t be tempted to throw up the first few questions that spring to mind. This is an opportunity to get direct feedback from your customers, so don’t waste it. Think about what you want to learn and which pages of your site would be best to ask them on. For example, you wouldn’t ask “Why did you buy from us?” on the ‘contact us page’ - you’d ask it on the ‘Thank you for buying from us page’. Let the data start pouring in and do as we did before; try and figure out how to overcome these customer concerns, which are literally being handed to you. So we have our data, we have our creative workarounds and how we want them displayed on the site. Now, we want to look at testing what we have learnt. 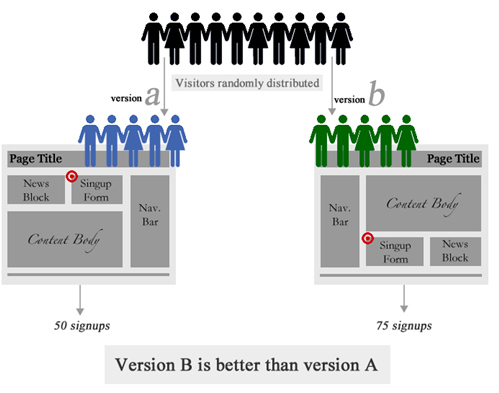 To do this we can look at A/B testing. This is the process of showing 50% of your traffic the original version of the page and 50% to the newly created variation version, to see which one converts the best. Image credit Doing this you will be able to see if your new page layouts are working. The last thing you want is to have made drastic changes, only to have made the wrong decision. So trial your changes, before you make them permanent changes. You can set up A/B testing through your Google Analytics account for free. You can find it listed as ‘Experiments’ under the content tab. Think I’m right, wrong or want to add something? Leave your thoughts in the comments box below.